These cute little sandals have me wishing for spring. I love boots as much as the next girl, but I have a massive collection of flats and sandals that I am dying to wear. These come with the added bonus of not having to bend over to put them on. Warm weather can't come soon enough. What do you think? Would you rock these? Leave your thoughts below. Cute! I actually like the Target ones better! I might have to pick some of those up! Thanks for the heads up! No way! I love Seychelles, so I'm glad there's an exact replica at Target! Wow - that is such a great match! Nice job! Love this! I'm buying the Target ones as we speak. ha. wow I want them! I have the yellow ones on my wish list from endless.com. As opposed to you I have close to none flat sandals!! Great find. I really like your blog. I don't think people need to spend a lot of money to look good. Your prices are right up my alley. 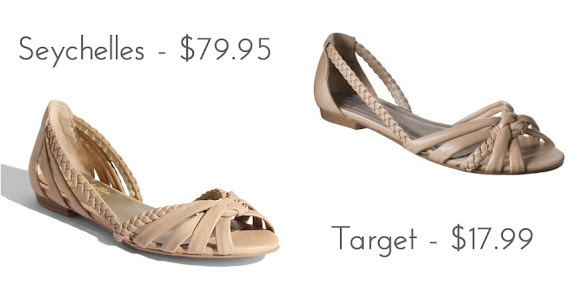 Target and Payless both had braided sandals like this about a year back, though these ones are more delicate-looking. I bought them in silver and black! Can't wait for weather to warm up. Wow!! Spot on, and lovely to know because I would definitely grab a pair (at the Target price). Very gracious of you to share your great matching skills! I just bought these ones at Target today. One thing I would recommend if possible is to try them at store. I found the sizing a bit weird. I usually wear size 6 and for the black pair size 6 was fine but for the beige ones 5 1/2 was much better. I ended up buying size 6 for the beige pair (even though they almost want to slip off my feet when I walk and I will have to add inserts to it) because the braid was rubbing against my little toe in a very uncomfortable way. These sandals don't seem to be too comfortable yet but I hope this will change over time. Meanwhile I will keep looking for the perfect shoes (if they even exist) where I won't need to wear inserts or band-aids!